If you have made plans to bug out should disaster strike or a society-changing event happen, then you are one step ahead of many preppers. Ideally, you have your bug out location chosen, stocked, and ready to go at a moment’s notice. At this point, there’s only one question remaining. How are you gonna get there? In other words, do you have a bug out vehicle that is ready to take you to your bug out location? Is it properly maintained and prepared to keep you safe and help you move as quickly as possible? Bugging out isn’t as simple as jumping in your bug out vehicle and hitting the road—well, it can be, if your ride is adequately prepared. But there is a lot that goes into the preparation of your bug out vehicle, starting with the type of transportation you have. Not everyone has the luxury of purchasing a car or truck to use specifically as a bug out vehicle. Many, if not most, will need to use whatever is already parked in their driveway. The majority of this post focuses on how to prepare any car to be a bug out vehicle. However, first, let’s just take a look at the various modes of transportation you can use as your bug out vehicle. SUV: An SUV, or sport utility vehicle, is generally a four-wheel-drive or all-wheel-drive automobile. This type of automobile is a good choice as a bug out vehicle because it gets decent gas mileage and can traverse rough ground. It can also carry a lot of gear and can easily double as your regular family transportation. Jeep is a go-to when it comes to a rugged set of wheels. The Jeep Wrangler deserves special mention here. 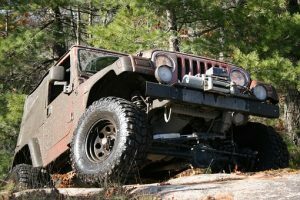 It is about as rugged a bug out vehicle as you can imagine and can be driven across nearly any terrain. You can enhance it using after-market parts so it can operate in extreme conditions. Just remember that it has a smaller capacity for carrying gear, although it can haul a trailer. Truck: Similar to the SUV, a pickup truck that has four-wheel-drive or all-wheel-drive makes a great bug out vehicle. It has a lot of room for gear, but be sure you have a large cab if you have a family to take with you. Again, you can also use a truck as your everyday mode of transportation. Camper: A camper makes a good choice as a bug out vehicle. It is more restricted in terms of the ruggedness of the terrain it can handle. However, it is ideal for carrying a lot of people and gear and it has amenities that make it a good home-away-from-home. In fact, you could live in it if you had to. ATV: This is another automobile that can go just about anywhere, although it does have its limitations. In particular, you can only fit one or two people on it. It also cannot carry a lot of gear, so you might need to haul a trailer behind it. But if you’re on your own, then this might be a good option. It also serves as a good backup. Motorcycle: If you are on your own, or perhaps traveling with one other person, then a motorcycle is a great choice for a bug out vehicle. Again, it can’t carry much gear, but if you are already set up at your bug out location, you can get away with minimal gear. Plus, a motorcycle is very maneuverable. It can get through those inevitable traffic jams that will occur when everyone tries to flee the city. Boat: If you are near the ocean or a river, then a boat might make getting away easy. If you have a large boat on the ocean or a large river or lake, it could serve as both a bug out location and a bug out vehicle. Or you can take a smaller motorboat to a location well outside of town and make your way from there. Just be sure you have a plan to get to and from the boat. Bicycle: If you cannot get out of the city via a motorized automobile, a bicycle is highly effective. You can take it many places you can’t drive a car and you can attach a trailer to the back to haul supplies. If everyone in your party has a bike, then you can all bug out together and hopefully stay under the radar. Your feet: When all else fails, you can walk out of town. True, you can’t carry as much gear and you will be going much more slowly than if you were driving. However, you can really get off the beaten path and stay hidden far more easily. Plus, other than needing to rest every now and then, your feet won’t breakdown or need gas. Do NOT let your gas tank get below half-full. Ever. Regular vehicle maintenance is critical. Always perform a daily check of your car to ensure the tires look good and there are no leaks or obvious problems. Stick to your regular maintenance plan like glue. Ensure all oil changes, filter changes, fluid changes, tire rotation, and tire pressure checks are done on schedule. Be sure to rotate the food and supply you keep in your car, just as you would the food and water in your bug in and bug out locations. PRO TIP: Be sure not to leave water in your car when it gets too hot outside. The plastic in the bottles might leak and contaminate the water. Now, you don’t need to become a certified mechanic. But the more skills and knowledge you build up in the area of car repair and upkeep, the better off you will be. Tires should be of good quality. 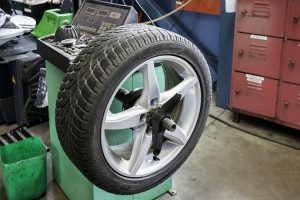 They shouldn’t be more than 10% larger than the original tires, unless you are changing the drivetrain and suspension of the vehicle. Ensure your tire pressure is per specification in the drivers side doorwell. Consider getting run-flat tires. These are used by the military and will allow you to drive up to 100 miles on the flat. They cost more, but they are worth it. Now that we have the car kit essentials covered, it’s time to consider all the other essentials you should have. First and foremost, you should always have your get home bag in your car. This will help you in any situation. 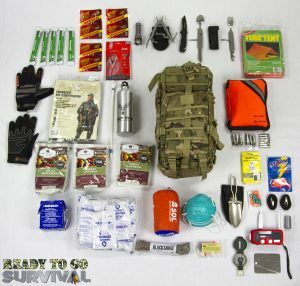 Always have a fully stocked bug out bag with you. Spare chargers for cell phones, etc. Just remember that you have a limited amount of space in your vehicle. You need to prioritize; get the highest-quality, most compact gear you can; and pack things well. A rooftop cargo carrier/rack: This will allow you to carry more food, water, and supplies without the need to haul a trailer. Extra lights: You can add additional lights to your vehicle, which can help in any number of situations. They help increase visibility while on the road or when setting up camp. An extra gas tank: This can help you carry extra gas, without it being obvious. Plus, if someone was to steal the gas out of your tank, chances are they would only go after the primary tank. Grill guard: This will help protect the front of your automobile. CB or ham radio: Even if you aren’t licensed to broadcast on a ham or CB radio, you can still listen in, gathering critical information. Plus, if the situation is bad enough, it won’t matter if you are licensed. Night-vision: If you can afford night-vision goggles, that is ideal. If you can’t, you can still buy a thermal imager. This will allow you to detect sources of heat in your surrounding environment. Being able to detect other people and cars at night can mean the difference between life and death. Security Film: This is for the side windows in your vehicle (the front and back are already break-proof). They are expensive, but once installed, they will make your windows difficult to break. This will deter any would-be thieves from stealing your bug out supplies or your vehicle. Have your bug out vehicle ready to leave at a moment’s notice. Pre-test your fuel consumption in different conditions and with different loads. This way, you will know your gas mileage when you bug out. If you go off-road, try to drive in as straight a line as possible and don’t underestimate the terrain. Always keep a close eye on the weather. Stay off the major city streets and highways whenever possible. Stick to back roads if you can. Get training on specialized driving techniques, such as high-speed driving, driving with obstacles, doing a reverse 180, accelerating in reverse, and other evade and escape techniques. You can learn these through special courses, such as a race car driving course, bad weather driving course, or all-terrain driving course. Stay with your car unless you must leave it. If you do leave it, then park it out of view and be sure you can find it again. Even though you will have a lot of food, water, and supplies in your vehicle, have your bug out bag packed and ready to go. You might have to abandon your ride, so you want the essentials ready to go, even if you have to leave some of your supplies behind. No matter how well-stocked your bug out vehicle is, make sure you have a plan. Know where you’re going and how you are getting there. Have backup routes planned. If you think you will need them, prepare caches of food, water, and supplies along your bug out route. In the end, the only thing between you and your bug out location, or at least the safety of getting out of the city, might be the quality of your bug out vehicle. You want to be sure you have taken the time to make your automobile as safe and prepared as possible. You also want to learn the skills you will need on the road. Anything you think we missed? Let us know in the comments below. Picked up a few good tips. Hey Fabian, I was looking to turn my SUV into a bug out vehicle. And I came across such a useful article of yours that has certainly help me a lot. Thanks for sharing this information with us. I would also recommend this article to my friends. My Ram is ready and it stays ready,equipped with bicycle and kayak! 4×4 and allseason tires,extra fuel,tools,water,food and fishing equipment! Well, there are several types of RVs. In my case, it’s a fifth wheel trailer, which is in my opinion, the best type of trailer for a variety of reasons. That is a whole different topic. Since my RV is unpowered, I don’t have to deal with maintenance for another drivetrain. I do have to deal with some mechanical things, but most of them are simple: proper lug torque, air pressure, brake pads, bearings, grease, etc. Some people go way longer, but I decided to replace and repack my bearings every 2 years or 25K miles, whichever comes first. Probably overly preventative. Other than that it is mostly as-needed. I do a major annual inspection where I go over the thing with a fine-tooth comb. Most of these trailers come with drum brakes, which last forever but don’t stop as well as discs. I upgraded to disc, so in addition to brake pads, I have to make sure the hydraulic pump is happy, which mostly equates to just making sure it has plenty of fluid. The same goes for the other hydraulic pumps on board. I carry a small self-repair kit for the hydraulics and such that has extra seals, o-rings, etc I might need if an issue arises. For electrical and plumbing, the thing is basically a rolling house. You do need to keep the pipes from freezing and whatnot in the winter, but in my location (Central Texas) and with my rig (heavily insulated, with tank warmers) I don’t need to go through a full winterization process. YMMV if you live elsewhere. No maintenance is really needed for electrical or plumbing aside from routine sewer treatments/cleanout, which can be done with onboard valves and such. You don’t have to get your hands dirty. The roof is by far the biggest factor in maintenance. A bad roof will ruin a RV in a heartbeat. On the flip side, a good roof can make one last a very, very long time. We got rid of the OEM roof and replaced it with a maintenance free “RV FlexArmor” roof. It’s seems 100x more durable and doesn’t require any care. Easily the best addition we have for ours when it comes to peace of mind. If you don’t go that route, annual caulking and frequent inspections should occur. And carry some Eternabond or other emergency repair tape in case you ever need it. We opted to have a 5500w Onan generator in our RV. It runs on propane, so it doesn’t gum up when sitting a long time, but it does need oil and filter changes every once in a while, which are very simple. It has an hour meter on the inside of the rig to tell you when they are due. If you are mechanically inclined, you can fix any problem with it pretty easily. Kitchen appliances are all propane. Those lines don’t need much maintenance but I do check all the easy to access connections annually for leaks with a spray bottle and some soapy water. Thanks Brother, glad you found value in it.